SINGAPORE — Day one of the HSBC Singapore Rugby Sevens did not disappoint fans here at the National Stadium. High-scoring matches, a colourful display of fancy-dress outfits and deafening cheers from fans rooting on their rugby heroes made it a fantastic atmosphere for the spectators. The morning started with New Zealand making clear their intentions with a 43-0 win over World Cup hosts, Japan. England, USA and South Africa followed suit and logged high scoring games at the expense of Kenya, Wales and Scotland respectively. 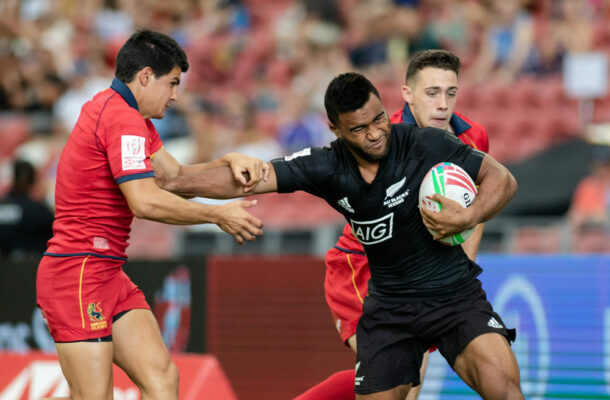 Defending champion of the HSBC Singapore Rugby Sevens, Fiji, swept aside a brave Canadian side by using their trademark handling moves, delighting the crowd with their dominant showing (50 – 12) over Canada. Things didn’t go quite as planned for the crowd favourite as they lost their next two matches to Scotland (12 – 19) and South Africa (7 – 17). The other three teams in the Top 4 of the table – USA, New Zealand and South Africa – had a good day in the office with three wins for the day. New Zealand continued to show their dominance against a spirited Spanish side (53-0) while Samoa nearly notched a win over the All Blacks but the latter’s resilience and experience saw the match end in New Zealand’s favour (26-22). USA had similar fortunes with a narrow win over Kenya (17 – 14) before outsmarting England in their final game today (22 – 7). South Africa impressed with their strong (36 – 0) win over Canada and finished the day on a high, defeating Fiji in their final game. As announced at Tuesdays press conference, dependent on results this weekend in Singapore, both USA and Fiji are on the brink of being amongst the first qualifiers for the Rugby Sevens at the Summer Olympics in Tokyo next year. USA took 3 wins from 3 today so stay top of the series standings and are showing their consistency across the series here in Asia. USA captain Madison Hughes was pleased with this team’s performance today and said “I’m really impressed with how the guys worked for one another. We maintained possession and grinded it out. We did nothing particularly flashy but we worked together and came in with a win against a good England team. Away from the Rugby, Smash Mouth got the crowd dancing with their renditions of much-loved music classics. The noise lifted in the National Stadium and the American band gave an explosive show which added to the exciting aura that had filled the bowl area. In addition to Smash Mouth, fans and attendees of the HSBC Singapore Rugby Sevens enjoyed the Singapore Sevens Splash Party, Super Warrior 7s at Community Play Day, opportunities to meet beloved characters from DreamWorks like Trolls and the Minions by Illumination, as well as rugby legends Huriana Manuel, Waisale Serevi, George Gregan and DJ Forbes. Tomorrows action kicks off from 10am where Scotland will take on Spain. Tickets for the HSBC Singapore Rugby Sevens are available and on sale from $19 for youth and $39 for adults. Family packages and premium tickets can be purchased via the Singapore 7s website www.singapore7s.sgSports Hub Tix website www.sportshubtix.sg, hotline +65 3158 7888, Sports Hub Tix Box Office at Singapore Indoor Stadium, The Star Performing Arts Centre Box Office, Scotts Square Concierge Desk, and all SingPost outlets. For all Private Suite and The Greenyards Club hospitality enquiries, email hospitality@singapore7s.sg.